The Hann Tote Tray Garage Cabinet is constructed of hard maple solids and panels, and features heavy-duty face frame construction. 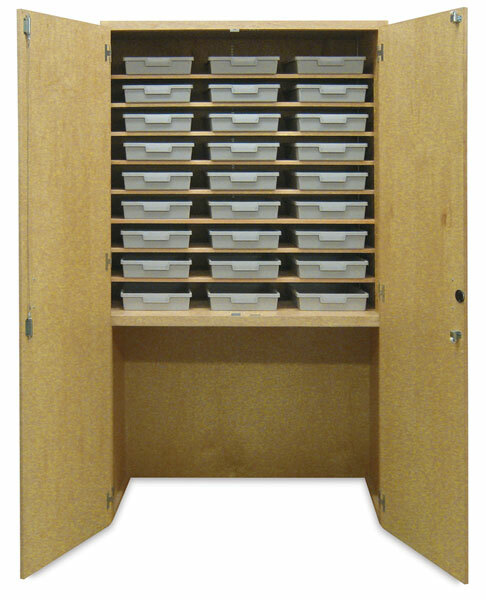 The interior features nine adjustable shelves that accommodate 27 Hann Certwood Tote Trays, measuring 12¼"W × 3"H × 16¾"L, and an open compartment measuring 44"W × 35"H × 21"D for secure storage of mobile carts or other items. This flexible configuration allows users to make the most of the cabinet as their storage requirements change. Molded from shatterproof high-impact polystyrene, the Tote Trays feature a clear label holder on one end and a stippled area on the other end for quick, easy removal of adhesive labels. Hann Mobile Tote Tray Cart — If more storage is desired, the Hann Mobile Tote Tray Cart fits into the Hann Tote Tray Garage Cabinet, creating a large storage chest with plenty of capacity, all in the same housing. The Hann Mobile Tote Tray Cart measures 29¼"H × 41¾"W × 18"D (74 cm × 106 cm × 46 cm). Some assembly is required.